With the Japanese edition of Dungeons and Dragons 5th edition coming out this Autumn, there has been an increased interest in D&D. We’ve had a number of new players, or those returning from older editions, stop by the Wednesday night Adventurer’s League as well. There’s a Japanese language stream of D&D on Friday nights that just recently restarted after a hiatus called Friday Night Adventurers (金曜夜は冒険者). It’s structured in a way that also teaches a bit of the system. There is a natural feel to it, like we’re just joining in and watching a group play instead of watching a more theatric performance. While enjoyable to watch for veteran players, I imagine this style is especially helpful for beginners and those who have an interest in seeing how a real game plays out. Hopefully this and the Japanese edition will increase the number of players in Japan. 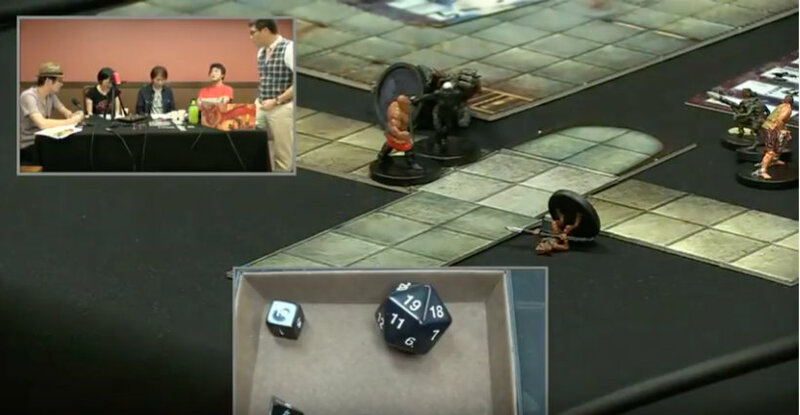 Having seen first hand what goes into producing a stream when I joined my buddy BerlingsBeard’s stream a few times, I was impressed by the use of multiple cameras to show the players, map, and dice rolls clearly, and that they also used video overlays. The embedded video below starts at the player and character introductions (30:30). Collecting equipment and a counterattack! In the announcements, they mentioned a Wednesday night stream put on by Daydream Cafe on Nico Nico. Watching streams that have ended on Nico Nico requires a premium account. Part two will be live September 15th 7:30 PM JST. While they’ve started up their D&D stream again, their Youtube channel also has a lot of other gaming videos: Warhammer RPG, older editions of D&D, and board games.